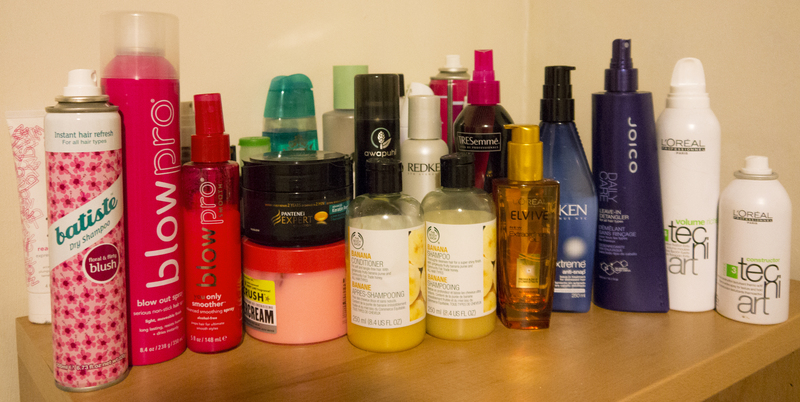 As a hair blogger, I hope you agree that it is understandable I have a ridiculous amount of hair products! My parents certainly don’t. However, this doesn’t mean that a good quality hair routine needs lots of different lotions and potions, quite the opposite in fact, it’s about finding the products that are right for your specific hair type. I have fine hair that is relatively healthy, so I try to stick to volumising/thickening products and balance them out with deep conditioners and oils to prevent damage. Unfortunately, this list is subject to change as there are very few hair products that I’m loyal too, but the ones I do are my holy grail products and I will use them every single week without fail; I would highly recommend everyone to add them into their routine! So I’m currently using the Bodyshop Banana shampoo & conditioner, which I have reviewed on my previous post. I like them a lot, but I imagine I will be very bored of the scent by the end of the bottles so I will be switching them up when I have finished. The only shampoos & conditioners I have bought twice are the Redken Extreme range ones, when I was nursing my hair back to health from a dip dye disaster. These are fantastic products and I would recommend them to anyone with damaged hair, and if I don’t get my hair trimmed soon I’m going to need to order myself another lot! My hair mask of the moment is the new Pantene Advanced Keratin Repair which I bought on offer from superdrug for £4.97. I am actually really impressed with this deep conditioner, it boldly claims to restore two years worth of damage in 2 minutes and although I can’t technically test this, my hair does feel stronger and my split ends just seem to disappear when I use it which is fantastic. I’m normally a bit of a snob when it comes to hair masks, opting for Kerastase or Redken but I think it’s highly likely I will buy this again. So I’m still using my Joico leave-in conditioner and detangler, it seems to be lasting a really long time which makes it great value for just £11. I use it each time I wash my hair after towel drying and it means I cause minimal damage during the drying process, you can read my full review and tutorial from a few months ago here. This is my absolute favourite hair product of all time and I must have repurchased it at least 5 times in the last 2 years. It’s the Redken Extreme Anti-Snap Treatment, a protein and ceramide lotion that penetrates the hair shaft to restore and fortify it, protecting it against any further damage, and it really works! I honestly can’t swear by this stuff enough, I hardly ever see any visible damage to my hair and I believe this is product is the reason. This is probably the hardest one to write about because it changes pretty much every week dependent on what I’m doing, what new products I have found on the market, and sometimes I have a detox and don’t use any at all! I’d say my favourite styling product is Redken Thickening Lotion which really makes my actual hair strands feel plumped up and voluminous, great for nights out. If I’m using my rollers I find the Treseme Root Booster Spray is very effective and keeps the volume for a full day. If I’m curling my hair I will always use the L’oreal Techni Art Constructor as this is very effective heat protector and keeps my curls in place all day whilst adding texture, I get mine from my local salon for £10, but I’m pretty sure LookFantastic.com sell the range too. Another product I am fiercely loyal to since its launch is the L’oreal Extraordinary Oil. This product really delivers for such a reasonable price tag and for me, is far better than the over-hyped Moroccan Oil. It leaves my hair glossy and smooth, concealing any split ends. Just make sure you use this after any heat styling or you will cook your hair like frying food in oil, ouch! It also comes in new formulations for coloured or fine hair now, very similar to the Kerastase oils range. Would highly recommend. So yep, that’s most of the products that I’m currently using on my hair, from time to time I substitute in natural alternatives like coconut oil or rosemary water, it just depends on my mood. If I was to write this post again in 6 weeks I’m sure it will have drastically changed so I may start doing a traditional beauty bloggers ‘Monthly Favourites’ type post so I can keep a record. I hope you enjoyed reading this and you found it informative, next post I will discuss the best way to start a hair growth journey and give you a proper update on how mine is going as I haven’t talked about it for a while. Posted in Hair care and tagged Beauty, conditioner, hair, Hair care, hair oil, hair products, hair tips, haircare, hairstyling, review, shampoo, styling. Bookmark the permalink.